Being back in the high heat and humidity (already), I appreciate a simple thong sandal, if only for nostalgia, but I have to encourage more sophisticated decision-making. So what are the best men’s sandals this year? A Florida upbringing means thong sandals (a.k.a. 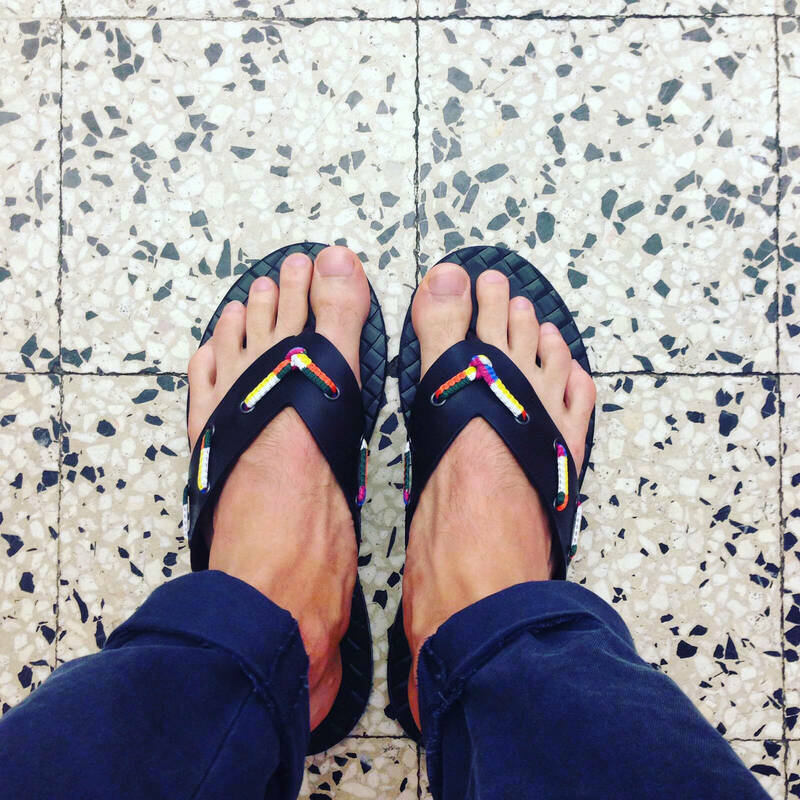 flip-flops) are implied, and often the default, footwear of choice for summer. After living in Europe, I began to notice the many forms of open-toed shoes available, and barely touched my Ralph Lauren red canvas and leather ‘flops over the course of 15 months. Italians don’t do rubber or foam sandals unless they are at the beach. I will argue this is how it should be, but I’m in the minority in Tampa. A traditionalist might choose a hearty, practical Birkenstock. I wore them in high school, but for some reason only the damp, stifling clog version. Go for the Ramses thong sandal, which comes in various finishes and starts around $100. Find them locally (in Tampa) at Dillard’s, The Walking Company, and Happy Feet Plus, which has multiple locations. The glorified pool slide, à la Adidas, has found great popularity in 2017. Paul Smith ($295) makes an attractive version in navy leather with grosgrain striped trim. If you’re extra lux-inclined, Bottega Veneta ($560) has you covered, in its signature intrecciato woven lambskin. I also like these from To Boot ($250), which are criss-cross slides, a bit more design-y than the single wide strap above. Speaking of flip-flops, upgrade yours with a pair in leather. WANT Les Essentiels ($225), Island Slipper (via J.Crew) $90, and Ralph Lauren ($295) make some attractive ones in brown and black. If leather isn’t your thing but you still want a bit of polish, consider James Perse ($125), king of California casual. Or, go animal-friendly with Stella McCartney! She has a newly-launched mens line, and it includes casual footwear, like these faux-leather slides, made in Spain, with a molded rubber and cork sole. They’re cheaper on Matches for some reason ($244 vs. $380). Somewhere between slide, thong, and what cavemen would have worn are these Frye sandals ($198). I love the copper riveted detail, a touch that will age nicely. Frye is known for their hard-wearing boots, so one can assume they make a sturdy sandal too. Look fellas: style is all about making investments in sound choices. Any of these pairs would live beyond a single season and would be kinder to your feet than those Havianas you look so comfortable in. For occasions other than the sandy shore, check out (more of) the best men’s sandals of 2017 HERE.